This is a tutorial I made for anyone who is looking to get a better understanding of how to draw realistic rabbits. It can also be seen at http://leporidae.org/howtodraw SECTION #1: BASIC SHAPES What This Guide is For Rabbits are difficult for a lot of people to draw. Not only are they fuzzy and squishy, but they can change shape when they sit, stretch, or jump. A rabbit's anatomy can defined in one moment, then utterly shapeless and blob-like in another. There are also many misconceptions about how rabbits look and how they're depicted in illustrations and media—everything from button noses to food pink pads. It's surprisingly hard to find realistic depictions of rabbits in movies, television, books, and even in places where fictional rabbits are supposed to look like the real thing. There's nothing wrong with stylaizing your bunnies, of course! We just want to make sure you know what features are stalized and which are real. This tutorial is designed to help artists understand what's real, what's misconception, and what proper rabbit anatomy should look like. 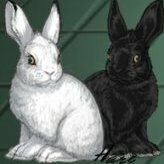 We have a few drawings and photographs to help demonstrate examples, and written information to help describe and guide anyone looking to draw realistic bunnies! Traditional Tutorial The first section of this guide is dedicated to traditional drawing tutorials (that's right, the ones with the weird shapes). As you can see, the body of a rabbit tends to look like a thick slinky that is slightly leaning to one side. The haunches (rear end) rest on the ground with the hocks (feet) and tail. The belly of a rabbit in a natural sitting/standing position may or may not have daylight underneathe depending on the breed of rabbit or its posture. Rabbit heads tend to be an oval-like shape that sits close to the body. When you look at the frontview of a rabbit's face, the chin sits on the point of an upside down V shape where the cheeks extend. Over the eyes are a brow that can be sketched out to the base of the ears if you want to detail the fur. Rabbits have whiskers on the brows as well (like cats), but they're not always visible (especially in rex furred breeds). SECTION #2: DO'S AND DON'TS Debunking Rabbit Anatomy Myths Oftentimes when we look at drawings of rabbits, especially cartoons, we see a lot of features that are inaccurate or missing in real rabbit anatomy: the button nose and foot pads to name a couple. Real rabbits, no matter what breed or species, have neither button noses nor foot pads like those found on cats and dogs. Keep in mind that We encourage all means of artistic expression and appreciate different styles and concepts! There is no wrong way to draw a bunny, but there is a right way to draw a realistic bunny, which is what this guide is for. We're going to start by going over the basics of what any rabbit should look like and maybe debunk a few common anatomical myths. The Button Nose One of the common anatomical stereotypes we see in rabbits is the button nose. It may twitch like a bunny nose and be adorable, but a real rabbit's nose looks much different (and is never wet). A real rabbit's nose looks like a slit with pink underneathe. The fur above the slit of their nose may be slightly pink (especially if the rabbit has white fur) because the fur gets very short and fine towards their nose. When a rabbit's nose twitches, it opens, showing little pink nostrils. The twitching of a rabbit's nose is that slit moving open and closed, allowing the rabbit to expand its nostrils as it sniffs around and breathes. Foot Pads Contrary to popular depictions, rabbits shouldn't have foot pads like a cat or dog. The bottoms of their feet are completely covered in coarse fur. They should be, anyway! It's important for bunnies to have healthy thick fur on the bottoms of their feet because the skin underneathe is very thin and delicate. They don't develop tough callouses to protect them like humans and some other animals. While a rabbit foot may appear to have have the pink 'foot pads' we see in some drawings if the fur is missing, that means the rabbit is likely suffering from worn feet and/or infection. A healthy rabbit foot should be fully furred with no pink on the bottom. The fur on the bottoms of a rabbit's feet starts out the same color as the rabbit's overall fur color as babies, then turns into a beige color as they get older (and might become tinted to match the color of the terrain they're used to walking on—rabbits that spend a lot of time on the grass will develop a green tint on their feet). Dewclaws Rabbits have dewclaws located on the front feet, similar to dogs. Declaws (pictured above) are on the inner sides of each foot and slightly further down that the opposite toe (similar to human thumbs). Rabbits have exactly five toes on the front feet (including dewclaw) and four toes on the back feet. Cottonball Tail Bunny tails are often drawn as perfectly round balls of fluff, you might even think there's no tail bones in there at all. In reality, rabbit tails have bones in them just like other animals, and they aren't round. If you were to shave a rabbit's tail, it would look short and skinny (but might be surprisingly long considering how short they look with fur). They are more like deer tails. The position of the tail is also commonly misrepresented. Unlike cats or dogs, a bunnit's tail wraps all the way down between the hind legs where the rabbit's rear is. Rabbits naturally sit on their tails, which bend around the curvature of their hindquarters. Rabbits may wiggle their tails from side to side when they dig or want to show off, and they show off the undersides of their tails (which may be almost white in some colors) when they kick their back legs into the air. Frontal Eyes It's common to humanize all animals in drawings, or make them look more like animals we're more familiar with (like cats and dogs), and there's certainly nothing wrong with that, but real rabbits have very different looking eyes from humans, cats, or dogs. The most important thing to know about rabbit eyes is that they face laterally on the head, allowing rabbits to see in almost every direction. They can even see directly behind them, but funny enought, they have a blind spot right in front of their nose! Therefore, bunny eyes face out on each side of the head and brow placement is further up above them. When a rabbit faces you directly, you are seeing the side of the eyes and the brows may dip slightly into a forehead. When the rabbit looks at you from the side, its eyes are facing you directly. When a rabbit has its head facing you at an angle, depending on the exact angle and how broad the bunny's head is, you might not see the other eye at all. Note that some breeds (like Netherland Dwarfs) might have such broad heads that you can't even see their eyes from the front! Human eyes also have the white parts of them visible at all times, but in rabbits (and many other animals), the whites of the eyes show when they are looking off in another direction (or when they are scared), showing the side of their eyeball that we wouldn't normally see. In a normal position, you will see just the iris and pupil. Rabbit eyes also look very different from human eyes when closed. They don't have an indented area around the eye and don't have eyebrows. You can see the bulge where their eyeballs are, or it might be shrouded in fluff (this is why hairless rabbits might look creepy to some people). Rabbits also have a third eyelid (called a nictitating membbrane) that may be visible in the corner of their eye, but you should probably avoid drawing this unless you are working on a higher detailed picture of a large breed (they tend to be more visible on large breeds, especially giants like Flemish Giants and English Lops). SECTION #3: More Than Skin Deep Bare Bones One of the reaons people have a difficult time drawing rabbits is because they aee fluffy, squishy, and (a bit) amorphous. Their body structure isn't as visible compared to that of a dog or horse. On a horse, you can see the muscles and shape of the hip, legs, chest, and neck, but you won't see much or any muscle on a furry rabbit. On a rabbit, you might have trouble knowing just where the hip starts under all the fur and skin, how thick their necks are, or whether they even have necks. Rabbits are masters at shape-shifting—they're plump balls of fuzz one moment, and then long and dartlike with big back legs the next. Above are a couple of pictures roughly outlining where the bones on a rabbit are located. The spine is an important frame of reference that can help guide you in shaping up a rabbit. When a rabbit sits normally (slightly bunched up), its spine is arched all the way to the ground, curving upward at the end into the tail. Rabbits can move their tails so they don't curve up, though. They can be straight or go straight down (usually when the rabbit is digging or stretching out on all fours to look around). Just like the tail, their spine can bend dramatically to become straight or even bending in the opposite direction from the natural arch (though not nearly as dramatically). A rabbit's spine may be straight or opposite-bending when laying down, jumping, or standing on their hind legs. You can use the spine as a frame of reference for where other parts might be. Obviously you have the skull at one end. At the other end, the bones in the back legs start at the base of the tail. If you're interested in learning more about rabbit anatomy, we recommend the Rabbit Dissection Manual by Bruce D. Wingerd. It contains more information and detailed pictures.